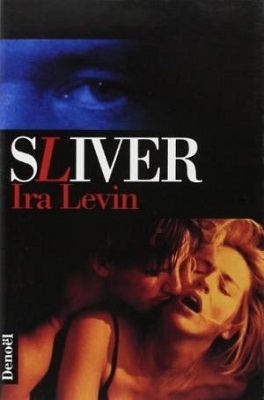 Sliver is a very different kind of story than Levin’s earlier work, Rosemary’s Baby, but the two books are similar in places. In Rosemary’s Baby, the central character, Rosemary Woodhouse, moves into an apartment in an old building called the Bamford; which is commonly known as The Black Bamford because of the long string of accidents and deaths associated with the building. In Sliver the central character, Kay Norris, moves into a building with a similar reputation. In this case, however; the building has a new, elegant sliver construction; but like the Bamford, the building at Thirteen Hundred Madison has been the scene of so many accidents and deaths it’s earned the nickname Horror High-Rise. Both books also have characters who have supposedly committed suicide by jumping from upper windows, but who have really been murdered. And in Rosemary’s Baby an elevator repairman gets a little careless and has a fatal accident. In Sliver it’s the building’s superintendent who falls into the elevator’s machinery and meets a messy end. These are just a few similarities that I noticed between Sliver and Rosemary’s Baby; if I had read the two books back-to-back I may have noticed even more. I am not criticizing; just stating that the books share some common ground. The main guts of the stories are very different. Rosemary’s Baby is a supernatural horror. The horrors in Sliver are very much of the flesh and blood kind. The first chapter of Sliver begins with Kay being shown around apartment 20B, but while Kay is taking a look at her prospective new home the owner of the building is taking an equally close look at her via cameras hidden in the light fittings. There are cameras in every room. Even the bathroom. The other apartments in the building are rigged out in a similar manner. The tenants of the sliver building are on camera twenty-four seven, but none of them are aware of it. For the mysterious and voyeuristic owner of the building it is like watching the ultimate reality TV show and he is more than willing to kill to protect his secret. Kay is thirty-nine and works as a Senior Editor at a publishing house. She is also recently divorced, so when she moves into 20B the only one sharing her life is her cat, Felice. It’s a fresh start for Kay and she soon settles in and makes herself at home, never realizing she is the new star of the hidden screens and the secret obsession of her audience of one. At the beginning of the book the main mystery is the identity of the owner of the building and the reader is quickly given a few possibilities to choose from. This isn’t one of those stories where you only find out at the end of the book, though. That particular cat is let out of the bag long before you reach the half way mark and I must admit that I found it impossible to guess which one of the prime suspects would turn out to be the owner. It could easily have been any of them. Once Kay finds out the truth about who owns the building it isn’t long before she finds out about the cameras and gradually becomes fascinated by the shows presented via the many screens. By the time she realizes the truth about the ‘accidents’ in the building she’s not only in too deep, she’s in over her head and could be destined for a body bag herself. Sliver is 214 pages long and is split into three parts. Although the book has been labelled as a horror novel it does not contain as much horror as most of the books it would probably share shelf space with at your local Barnes and Noble. The reader is always aware that Kay is probably in danger, but it is not until the thirty-some pages that form the third part of the book that the danger becomes a reality and most of the real horror begins. I did not enjoy reading Sliver as much as Rosemary’s Baby or The Stepford Wives, but it is a good solid story that will probably appeal to many readers who would not normally enjoy a book that bears the horror label. It might, however, prove to be a little tame for those readers who are used to plenty of horror in their horror stories. Either way though, for any reader who becomes really creeped out by the idea of someone watching them, reading Sliver could be the cause of many a bad dream.